As everyone trickles back in to the library this semester, take some time to walk towards the Van Pelt Collaborative Classroom (right before the WIC entrance, to the right) to see Dr. Rosemary Frasso’s graduate students’ research exhibit Life with Technology Among University of Pennsylvania Students. Dr. Frasso’s previous research exhibits include Pressure Release and Fear and Safety at Penn. I took some time this week to make my way through the exhibit and found it interesting to see how Penn students are understanding technology’s role in their lives. Here at WIC we post about tech frequently, and this past year alone we’ve discussed new ways of using social media tools, using apps for productivity and travel, and our experiences with 3d printing. Life with Technology takes a more in-depth look into the complicated ways students’ lives intersect with technology that can be both useful and intrusive. The exhibit is organized into thematic categories: Changing Times, Dependence, Disconnected, Efficiency, Health, Multitasking. Privacy, Social Connections, Ubiquitous, Unplugged, and Work and Education. In order to decide on a topic, students used Nominal Group Technique (NGT) in order to come to a consensus representative of the group’s preferences. Interviews were then conducted using photo elicitation (first named by photographer and researcher John Collier in 1957) in which a qualitative interview is guided by photographs taken by study participants. Each student recruited one participant, an undergraduate or graduate student from Penn, and explained the study to them. The topic of the project was explained and participants were asked to “define and explore the meaning of ‘life with technology’ over the course of one week using their phones to document their exploration.” Ultimately, the research team decided together on which images and quotes to use in the exhibit and how these pieces fit into categories. Some memorable images include dried cranberries, Penn classrooms, a kitchen stove, and selfies. From here, students will use NVivo 10 software for thematic analysis, and members of the research team will then identify salient themes, summarize findings, prepare an abstract for presentation, and a manuscript for publication. The exhibit is beautiful and engaging, so please come by and check it out at the Van Pelt Collaborative Classroom. If you are interested in using NVivo software, consider joining our NVivo User Group which meets monthly with a guest presenter for each session. We’re glad to announce our program report on the iPads in the Classroom pilot and welcome your comments. Please do share the report widely. We began our pilot at Gadget Day in August 2011and over the past year, we have explored the use of iPads in a variety of classroom, meeting and travel contexts – from pair-share video interviews on identity to capturing conference moments in New York City to collaborative critique of multimedia content. We have learned how to manage the iPads and also begun to understand how to help faculty and students become comfortable with them in an instructional context. 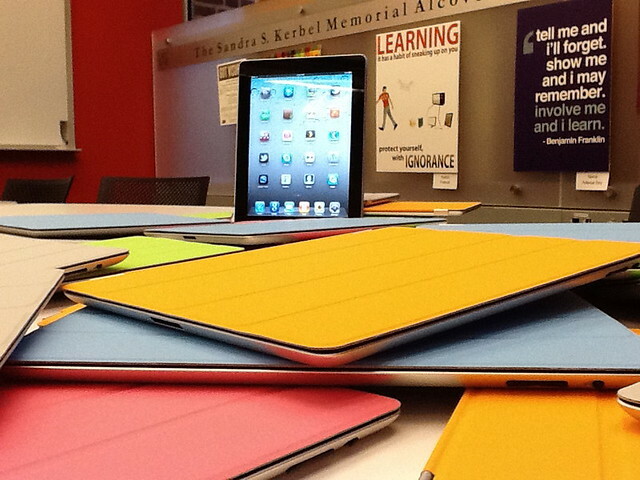 We welcome faculty to reserve the iPads for class projects this fall. Please stop by or email us. Students can take photos, capture videos, share articles, comment on PDFs, explore web resources and use specialized apps. We can add apps by request in case our current list does not meet your needs. We can load the iPads with readings, bookmarks, videos and other relevant content. You can look for apps tailored for your discipline at the app store or ask us for suggestions. The Apps on Tap blog provides a great resource for exploring apps for iPad, as well as other mobile platforms. 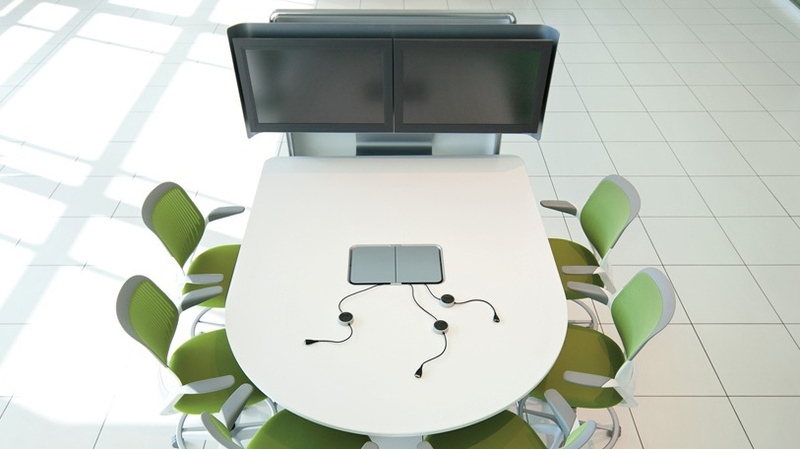 We invite you to come and take a test drive of a demo table from Steelcase. It is here for the next week just outside the entrance to the Vitale Digital Media Lab, 1st floor west of Van Pelt-Dietrich Library Center. We are considering purchase of this unit for one of our group study rooms. It is designed for small-group collaboration. Read the vendor description. The system has pucks to connect your laptop to control one or both screens. We have some laptops and an iPad2 available in the Vitale Digital Media Lab next door if you would like to borrow them to try at the Steelcase table. The system autodetects connected computers through a VGA cable and also has an audio cable. So far, we have had success with Mac and PC (Dell) laptops, an iPad2 and an iPhone – we would like to test connectivity to other mobile devices and laptop models. We would love to hear your comments on its functionality and possible uses. At the Engaging Students Through Technology Symposium 2010, Peter Decherney, Associate Professor of Cinema Studies and English, facilitated a panel discussion with four Penn undergraduates – Rivka Fogel, Thomas Jansen, Pranav Merchant and Tatiana Peisach – about the ways in which new technologies enhance and reduce learning both in and out of class. Students spoke frankly and passionately about their interest in robust and flexible online collaboration tools for note-taking and study. Watch the video of the student panel.